We are currently sold out of all our tents. Please get in touch to find out when we’ll be receiving our new stock. If you are interested in joining our mailing list, please register your interest with us by emailing contact@wildernest.co.nz. The Wildernest 5m Bell Tent™ offers you the best of both worlds - an integrated, heavy-duty zipped in groundsheet allowing you to roll the canvas side walls up on a hot summer's day, while having the security of mesh sides roll down to protect you from undesirable insects and keep your belongings safe. Remember, this tent will last a long time if you look after the canvas (never pack it away damp). The Wildernest 5m Bell Tent™ comes with a tarpaulin groundsheet which we have specifically designed and made to the footprint of the Wildernest 5m Bell Tent™. Please note that this tarpaulin is separate and extra to the tent itself and the reason for this addition is to keep your Wildernest 5m Bell Tent™ clean and dry from the damp ground. This makes packing down easy and it means less cleaning is required before storing. Ensure your tarpaulin groundsheet is stored separately if wet or dirty. The Wildernest 5m Bell Tent™ is made from a 360gsm Polycotton canvas and 650gsm PVC zipped on groundsheet. Poly cotton canvas is derived from a natural material. As such, colour variances and minor imperfections in the canvas can be expected. These variances and imperfections do not detract from the overall performance of the product. The Wildernest 5m Bell Tent™ is equipped with a heavy duty groundsheet that is attached to the tent with a zipper. The groundsheet is made out of PVC 650 gsm. 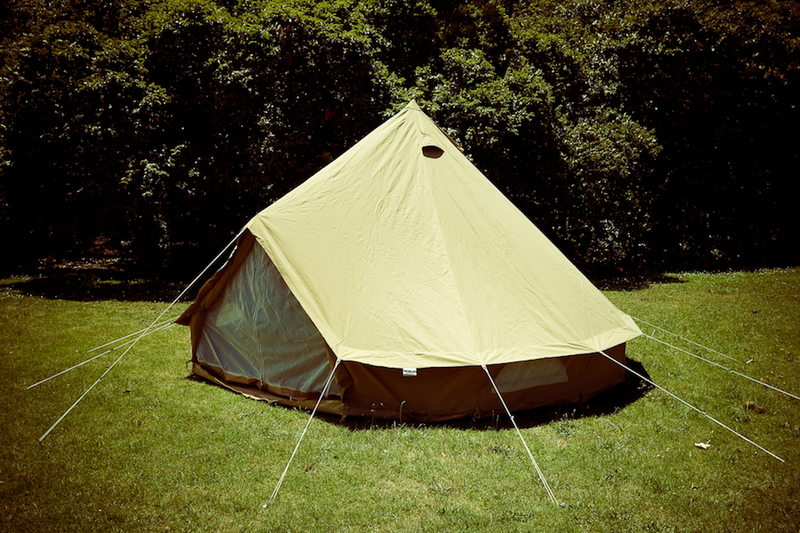 The upper body of the tent is made from a heavy-duty Polycotton canvas 360gsm. Very popular feature: The canvas sides easily roll up then roll the mesh wall down to allow the breeze to pass underneath on hot summer days keeping you cool. Centre Pole 3m high and 32mm dia. Fabulous sand colour creating a warm and romantic vibe. 100% waterproof tried and tested in New Zealand all year round! Moreover, the material is treated to be even more water and mould resistant. The inside of the tent remains 100% dry even after being out in the rain for days. This tent is very comfortable for 2 to 4 people, but can sleep up to 8 with a combination of double and single size airbeds. A-frame covered entrance (178 cm high). An A-frame entrance which creates a porch like environment to stop the rain from coming in, with a rain catcher that sits over the pole pin. Zipped front door for fast access. Loop ties on exterior for securing a Solar panel. The top centre vent has a zip section that allows power cables into the tent and down the centre pole from a solar panel. 4 x zipped half round windows complete with integrated mosquito mesh. 4 x detachable mesh storage pockets. Re-enforced canvas areas around each pole. Separate Mesh zipped in door. Larger sized top air vents than regular bell tents. It takes 1-2 people only 10 minutes to pitch. Beautifully made and quality built. Double stitching all around and reinforced key points. All packs down into a matching canvas bag small enough to easily fit in the back of the car. This is a high quality New Zealand spec Wildernest Bell Tent™. There are other bell tents about but our tents are very different to the bright white imports from many other places. We have fully tested to New Zealand standards for years with our glamping business and they have our official branding on this to reinforce this.